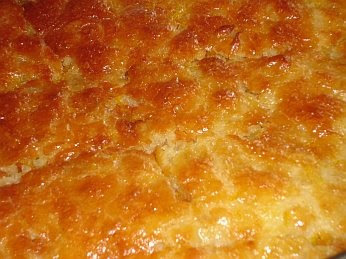 A delicious, refreshing pie for the hot summer months! It can also be served warm, but I much prefer it cold. It can also be served with ice cream. Mmmm! Leave the sheets of filo pastry out, separated and uncovered, to dry for a few hours. Crumble the sheets of filo. Put the olive oil and eggs in a mixing bowl and whisk well with a metal whisker. Add the yoghurt and baking powder and continue whisking until you have a smooth cream. Add the crumbled filo pastry and mix in well with your hands. Put in an oven dish and bake in a preheated oven at 180 degrees Celsius for 20 minutes until it turns a golden colour. In the meantime, prepare the syrup – boil the syrup ingredients in a pan for 5 minutes. 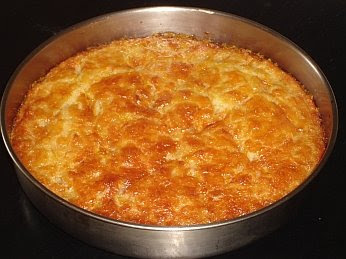 After removing the pie, once it is cold, cut into portions and spread the warm syrup on top. Yummy Yummy ~ This looks delicious!! Thanks for sharing the recipe! Oh wow this looks great! I am definitely going to try this and I have the pastry in the freezer too. Can we get to link exchange...? It looks very yummy! I am started to drool because of that Orange Pie.